This is the condenser set for use with 50mm and shorter focal length enlarging lenses on older Omega 4x5 condenser heads that do not have the variable condenser lens and on which you interchange condenser sets. The assembly consists of the two 3½" condenser lenses, the condenser housing or "spinning", and the lens spacer. 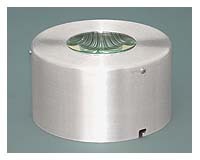 If you have the DV variable condenser lamphouse, this assembly is not required. These condenser assemblies are used, but are certified to be in perfect working condition. The metal parts have minor cosmetic marks that will not affect performance or, ultimately, the image.